A green label is not always a guarantee for actual sustainable practices. Photo by Jared Rice on Unsplash. When you are looking for sustainable accommodations, it can be hard to know how eco-friendly a place actually is. Especially if this is new to you, it can get quite confusing. Luckily there are green labels on booking or accommodation sites that will try to convince you of their efforts. But how do you know if they are really trustworthy and not just using ‘eco’ as a marketing term? This phenomenon is called greenwashing. And sadly, it’s a growing trend in the industry as sustainability becomes more and more popular among travellers. Moreover, ‘green’ labels are often expensive. Bigger hotels can afford to pay for them, regardless of how trustworthy those labels are in reality. This results in a distorted picture of the existing sustainable options. It abuses the trust of consumers who are trying to find truly eco-friendly places, because they are not aware of the greenwashing practices. It also lowers the standard of what actual sustainable practices entail. The efforts that helped them obtain this label, might just be a scratch on the surface instead of a structural part of their mission. Worst of all, small and genuine eco-friendly projects are often hidden from the view by the big players who have more to gain from maintaining the status-quo. That’s why it’s important to not blindly follow the labels, but to take matters into your own hands. Check out other aspects on the website of the place you’d like to stay. This will allow you to truly determine how sustainable their vision and efforts are. Small and genuine eco-friendly projects are often hidden from the view by the big players who have more to gain from maintaining the status-quo. It may sound complicated to find out if a place is either guilty of greenwashing practices or truly eco-friendly. But it doesn’t have to be. I’ll share a few recognisable features with you to easily help you identify truly sustainable accommodation. The good news is, owners with a genuine mission are most likely going to be very transparent on their website and in sharing their story. And of course also listen to your intuition. If a place is locally owned, it means that the revenues flow back into the local economy. But especially in tourism, foreign investors own a lot of places. If they transfer the money abroad, there is no local sustainable development. Check their sustainable practices. Do they f.e. have a policy to save water? You can deduce this by checking if the accommodation has a measuring system that shows you how long you stood in the shower. Or by not washing towels after you used them only once. If it’s a big place, there should be someone responsible for sustainability. Quality should be assured if someone is actually following up on this policy. There are a lot of options and materials available in different price ranges to construct buildings in a sustainable way. They can even incorporate upcycled or recycled materials like reclaimed wood. The same applies to energy sources. Does the hotel use alternative or renewable energy sources like solar panels? Are they trying to be energy efficient or even energy neutral? Examples of recycling you could check are: Do they use gray water recycling methods? Do they recycle waste? What is their plastic policy? Where do they use the land surrounding the place for? Ideally it serves as a (wild) garden or for the production of organically grown foods. Another aspect that shows their commitment to sustainable practices is their involvement in nature or wildlife conservation efforts. What kind of projects do they support? How transparent are they about it? How far does their involvement go? Some examples are if they work to halt deforestation or actively work on forestation in the region. They could host beach clean-ups or focus on environmental education among others. A truly sustainable place not only cares about nature but also about the surrounding community. Ideally, local people are employed and receive fair wages, are treated with respect and get the opportunity to follow trainings. Does the accommodation source products from the surrounding community? Other ways to empower the community is for example by supporting educational or health care projects directly or via collaboration with a non-profit organisation. This comprehensive overview is more than enough to get you started when selecting your next places to stay. 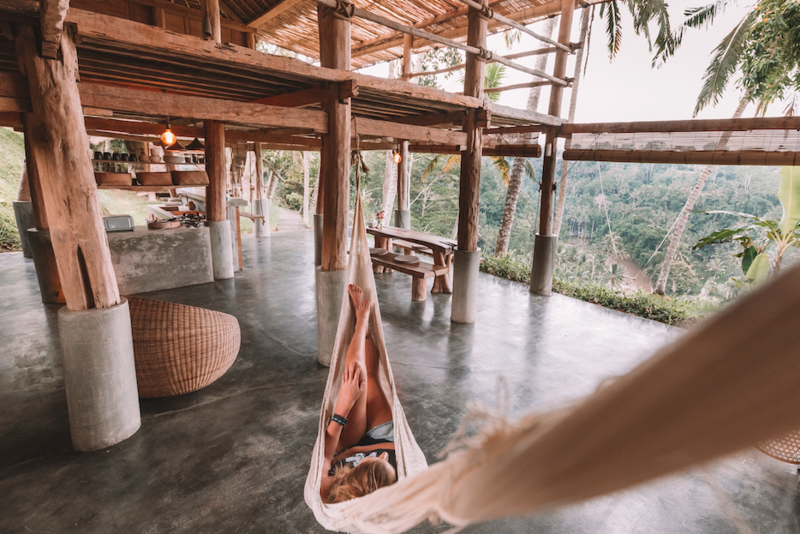 Some inspiring eco-pioneers that are very transparent about their efforts are north India’s first zero-waste guesthouse Hara House, the world’s first dome hotel Eco Camp in Patagonia, Chile and Bambu Indah in Bali, Indonesia. Do you want more information or ideas to start planning your next retreat? Get in touch with me or download my inspirational e-book! Yana Pannecoucke is a journalist from Antwerp, Belgium. Her passion for travel and sustainability led her to working in development aid and research on sustainable tourism on multiple continents. Now she combines her passion and skills in EcoScapes. She helps coaches and changemakers with research and logistics to set up their trips or retreats in an eco-friendly way. Her mission is to enhance the impact of responsible tourism as a catalyst for sustainable development. In her free time, she likes outdoor sports, such as rock climbing, hiking, but also freediving and yoga. Oh, and food, a lot.